Every holiday season Eleven Peppers Studios delivers a special gift to our clients, mentors, and supporters, just to say thank you. In 2015, we wanted to say Happy Holidays in a meaningful way, by giving back to the community. After reading the stories about children facing life-threatening medical conditions, and understanding what the Make-A-Wish-Foundation does for them, we were inspired to make individual donations to the organization on behalf of our clients, supporters, and mentors. To commemorate the donation, we aimed to personify the magic behind wishing. When we thought back on the last time we or someone close to us made a wish we immediately thought about blowing out the candles on a birthday cake… and with that an idea took flight. EPS collaborated with a local vendor to create Blood Orange Chili scented, hand-poured, soy candles. The scent was deliberately chosen as a not-so-subtle echo of the Eleven Peppers brand. 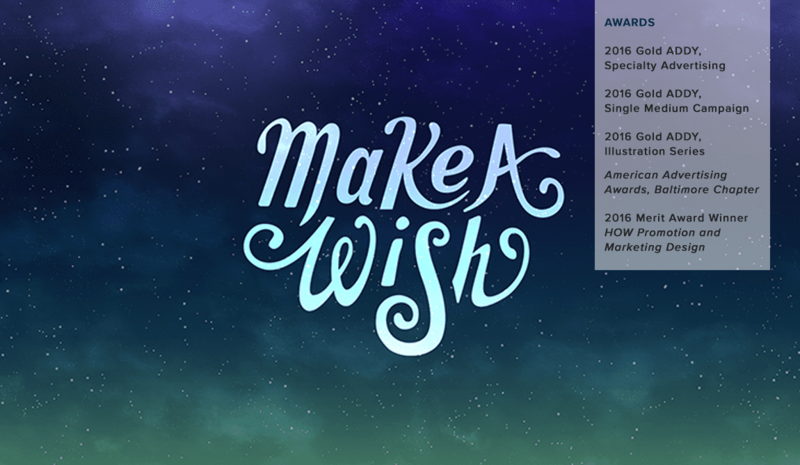 The Make-A-Wish-Foundation’s mission statement is to grant the wishes of children with life-threatening medical conditions to enhance the human experience with Hope, Strength, and Joy. With this in mind, EPS specifically designed the candles to incorporate three wicks to symbolize each word in the mission statement: the Hope of a parent or loved one, the Strength of a child who is going through treatment, and the Joy of all those who volunteer and are involved with these wishes. 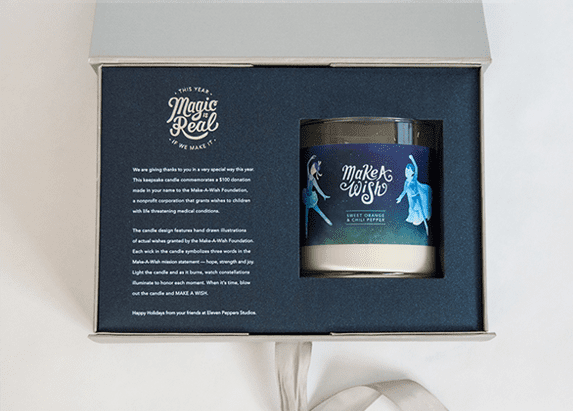 When it came to the design of the candle wrap and packaging we looked to the skies for inspiration and our inner-child was awoken by the whimsy that is wishing on a star. To strike the perfect balance between child-like fantasy and the timelessness of the stars, the candle wrap features hand-drawn figures inspired by children’s book illustrations in the form of constellations. These figures are the actual wishes from Make-A-Wish children and as a hidden surprise; tiny holes have been punched in them to illuminate these constellations when the candle is lit. 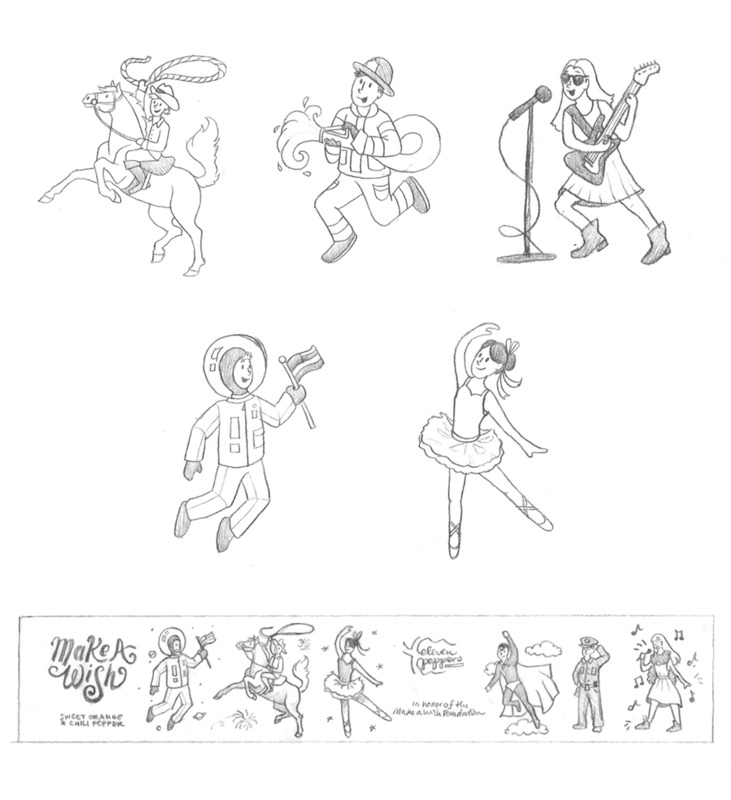 The package was wrapped in custom-made wrapping paper developed by Eleven Peppers Studio’s employees, family and friends. Each person had the opportunity to individually connect with, and portray, a child’s wish. We combined the numerous handwriting and illustration styles into a stunning repeating pattern to create the wrapping paper. 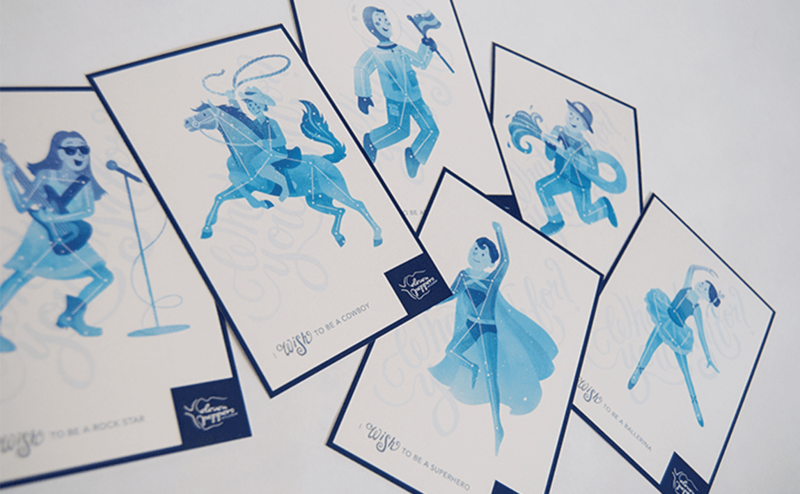 The gift embodies type, illustration and purpose in a fanciful yet classic style. 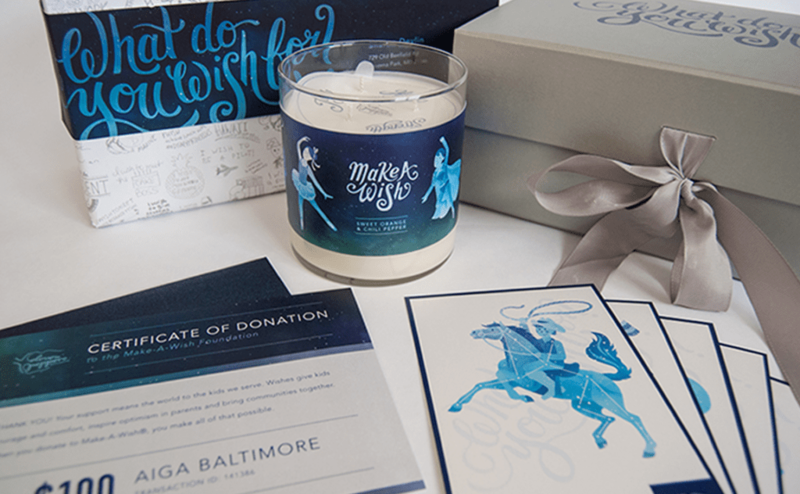 It honors the wishes of Make-A-Wish children and gives a whole new meaning to gift-giving. It was an absolute pleasure to design and put together such an expressive gift, and the feedback we have received from the recipients has been incredibly heart warming. The Make-A-Wish holiday gift created by Eleven Peppers was amazing. The creativity and thoughtfulness that went into this gift are awe inspiring. From the candle itself to the donation and wish cards, packaging and even the custom wrapping paper – Eleven Peppers created an amazing and truly touching gift.